When I was dreaming up the idea for the Growing Wild blog, I imagined that it would be an opportunity to explore nature here in the city. But I also imagined (and hoped), that it would be an opportunity to get to know a few of the people responsible for these spaces; both the ones that create them and the ones who are inspired by them. Last week, when I went to photograph the Larner Seeds Demonstration garden in Bolinas the latter opportunity presented itself. I wanted to visit the garden, ever since I read Gardening With a Wild Heart, by Judith Larner Lowry—who is also the seed shop and garden owner. The book captivated me. 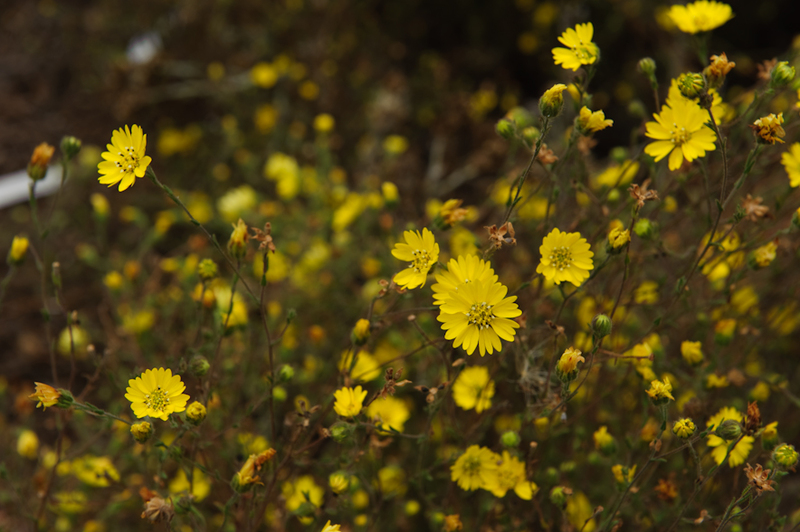 Judith's descriptions, and her love for CA native plants was contagious. I thought that doing a post featuring the garden would be the perfect opportunity to go. When I called up to ask to photograph the garden—and got a yes—I was extremely excited. As soon as I woke up on the day scheduled to photograph Larner Seeds I realized that I had gotten very lucky—it was heavily overcast—perfect for photographing gardens. I kept my fingers crossed that the overcast would last as I finished packing. While driving up the coast on highway 1 the fog only thickened and by the time I reached the breathtakingly beautiful town of Bolinas it was almost mist. After following Siri's directions along a series of back roads I pulled up in front of the garden. It was marked only by a small sign and plants were spilling over it. The gate stuck a little when I pushed it open. At first I saw no one—I only heard a few noisy birds which were flying between the garden shrubs and the larger trees in the distance. A little path led up to the garden shop. Judith graciously showed me around the garden, pointing out what was in bloom and rattling off the plants’ Latin names so quickly I could not even grab a pen. She showed me a circle of bare dirt in the back of the garden marked only by a few pieces of weathered wood. She explained it was an experiment to see which plants would sprout on their own—all she does is weed the invasive species. 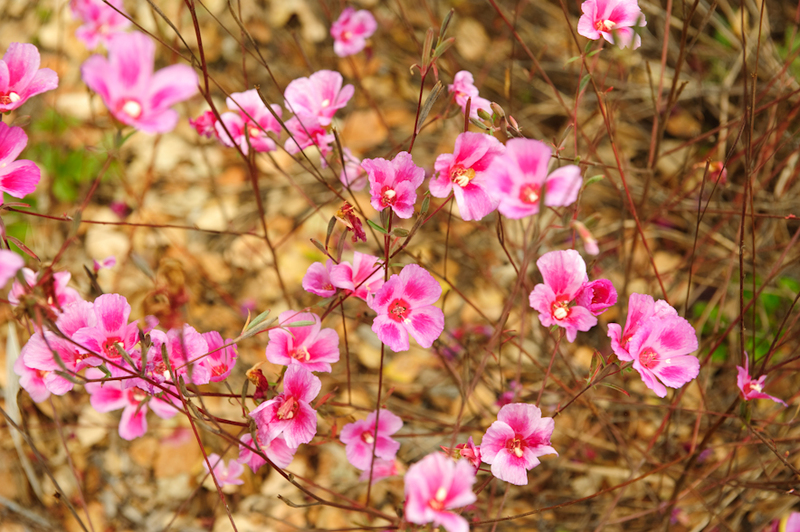 Already a rare plant—thought to be extinct, had appeared there. 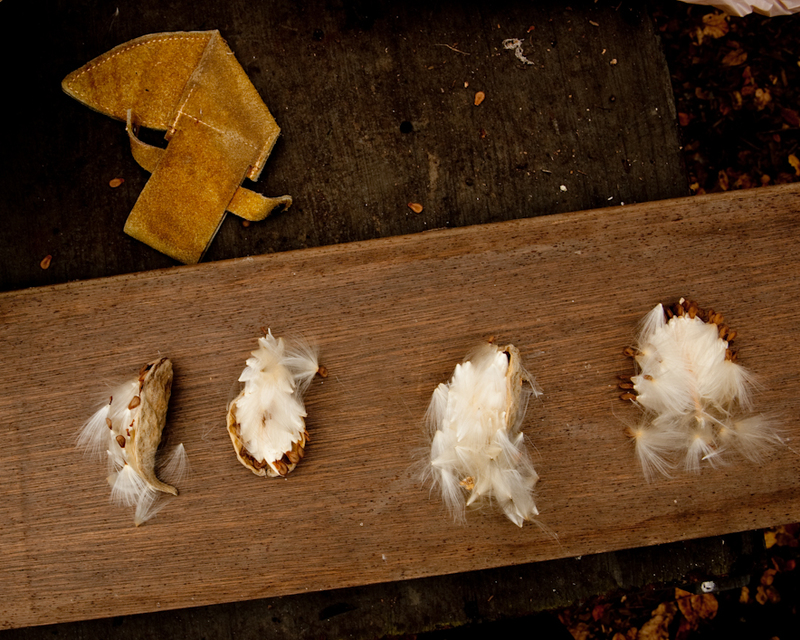 At one point Judith and one of her garden staff were working with Milkweed seeds on a large table in the back of the garden and they invited me to come photograph the fluffy seeds. While I was focused on finding the best way to capture the seeds and arranging them on the table Judith and her helper Ildiko were chatting away about the next steps for the seeds. I was in my element and they in theirs. For this brief moment I felt extremely lucky to be there, working by their side—seeing some of the realities behind the pages of that book that had inspired me years ago. In that moment I remembered clearly why I started this blog. These photos capture just one tiny sliver of the beauty that existed in the Larner seeds garden that day. As I drove back toward the city and back into the crazy Bay Area traffic later that afternoon I felt both refreshed by the visit and excited for whatever adventures may lay ahead.